The talus is a small bone of the ankle responsible for transferring weight bearing forces from the shin to the foot. During the movement of ankle dorsiflexion i.e. when the foot and shin move towards each other, the bottom of the shin bone approaches the front of the talus. This places compressive forces on the structures at the front of the ankle joint. If these forces are excessive or beyond what the ankle can withstand, damage and inflammation of these structures may occur. 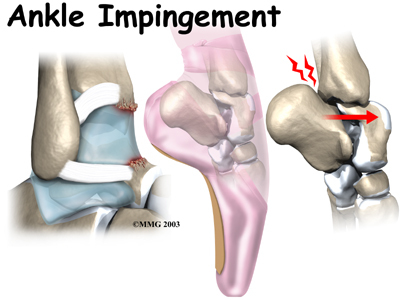 This condition is known as anterior ankle impingement. 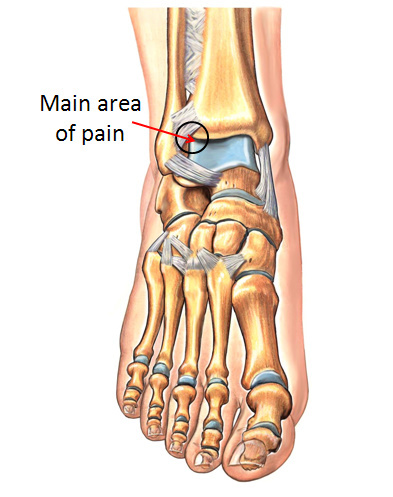 Occasionally, bony spurs can also form at the front of the ankle joint which may contribute to the problem. Anterior ankle impingement sometimes occurs following an ankle sprain or due to activities requiring repeated forced dorsiflexion. Ignoring symptoms or adopting a ‘no pain no gain’ attitude is likely to aggravate the condition and may lead to the problem becoming chronic. Immediate appropriate treatment is essential to ensure a speedy recovery. Patients with this condition should follow the R.I.C.E. regime in the initial phase of injury. The R.I.C.E regime is beneficial in the first 72 hours following injury or when inflammatory signs are present (i.e. morning pain or pain with rest). The R.I.C.E. regime involves rest from aggravating activities (crutches may be required), regular icing, the use of a compression bandage and keeping the leg elevated. Anti-inflammatory medication may also significantly hasten the healing process by reducing the pain and swelling associated with inflammation. A graduated and pain-free flexibility, strength and return to activity program under direction from a orthopaedic doctor is vital to ensure an optimal outcome. Alternative exercises placing minimal weight bearing forces through the ankle should be performed to maintain fitness such as swimming, cycling, and water running.